top-notch job. I would not hesitate to use Ron's services again." 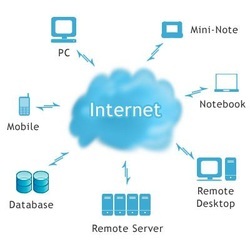 In an interview with Bloomberg (Cloud Computing is Growing at a `Tremendous' Rate) Diane Bryant, Intel VP states; "Cloud growth is tied to people accessing the Internet. For every 600 smart phones, every 120 tablets there is a server behind it. Intel architecture runs 90% share of all the servers in the world. There is an accelerating demand for big cloud data servers, not just for Google and Facebook data servers, but even from companies in emerging markets in China such as Baidu, Tencent...."
Intel benefited from the server growths already in 2011. Its sales grew 24% in 2011. "IC Insights' report of the top 25 semiconductor companies (see below) states that Intel grew 24% in 2011 due to the purchase of Infineon's wireless segment. It is likely that the growth of databases and cloud servers (20% of sales, 3x PC segment growth) also added to Intel's growth"
Also in an Intel, AMD, or ARM Servers? "The article...about low-power servers doesn't mention Intel's large growth in database servers. Intel had more than $10 billion in revenues from ICs sold into data centers, including servers, storage products, and networking"